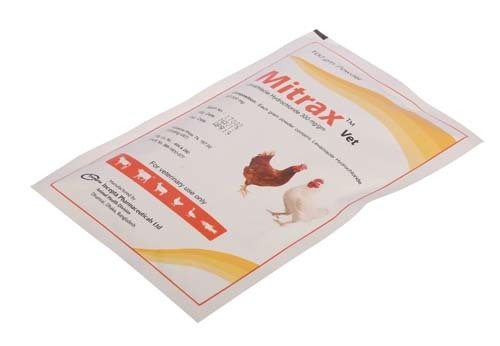 Mitrax: Each gram powder contains Levamisole Hydrochloride BP 300 mg .
Levamisole Hydrochloride is a synthetic broad spectrum anthelmintic highly effective against gastrointestinal and lung worms. Levamisole acts as ganglionic nicotinic acetylcholine antagonist on neuromuscular junction of round worm and enhances sensitive parasympathetic and sympathetic ganglion. It hampers carbohydrate metabolism of round worm through fumertae reduction and succinate oxidation inhibition and parasite cannot move and ultimatekly dies. Levamisole Hydrochloride is used for the eradication of nematodes (Round worm) of alimentary tract eg. Ascaridia galli, Heterakis gallinarum, Capillaria obsignata and respiratory tract eg. Syngamus trachea. It can also be used with water to eliminate fowl eye worm eg. Oxuspirura mansooni. 0.08 g/kg body weight or 1 g/litre of drinking water can be used for 7 layer birds or 10 pullets or for 20 birds of grower stage (4-6 weeks age). Single application can ensure total elimination of worms. There is no side effect of Levamisole Hydrochloride at recommended dose.